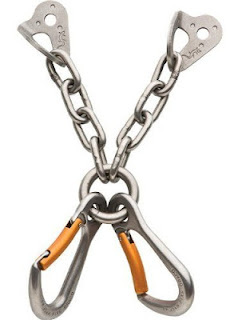 If you're in the process of bolting a multi-pitch climbing route and want to save some cash, here's a picture to inspire you: DIY belay station with anchor (hanger) and screw link for rappelling. All you need is a stainless steel flat-stock which you need to drill and bend. So you get a double bolted belay station at the fraction of the cost. This doesn't mean the professional Fixe hangers and chains are not worth it but when you spend your own money on a project like this (most of the cases I guess - that's our case at least) you don't wanna hurt your budget so badly. We use Fixe gear for all our sport climbing projects but this DIY thing is something to consider from now on. Be safe and chalk when you get pumped.